Limited vinyl with a speical edition 3D Lenticular cover that brings the iconic artwork to life! 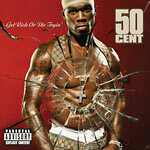 This is the 10 Year Anniversary Platinum Vinyl Edition of ''Get Rich or Die Tryin','' the debut studio album from 50 Cent. The album features production from Dr. Dre and Eminem, and featured guest appearances from Eminem and then-newcomers Young Buck, Lloyd Banks, and Tony Yayo of the group G-Unit.